The summer time can be the ultimate time for you to try out a new look and show off a new outfit or haircut. A warm sun-kissed tan can create a healthy glow for any occasion. Here are a few tips for creating a fresh new beauty look for the summer without sacrificing time in the sun. Removing dead skin cells and grease are important for creating any tan. It also helps the skin retain melanin for natural suntanning. A bronzer can create an instant tan on the face without looking blotchy. Use a powdered bronzer very lightly on the skin that matches your skin tone daily. Consider slowly going up a shade every few weeks to match cool to warm skin tones. The best tans occur over time to look real and blend in with your changing skin tone. Apply a tanning mouse or liquid product with a bit of lotion to blend in the skin. Reducing shine and glare on the skin is a great way to show off a soft summer glow on the face. You can encourage intake of vitamin A and C by eating fresh leafy greens such as a salad and fruit. These vitamins help keep the skin cells hydrated and refreshed throughout the summer. Use a daily moisturizer and a bit of natural jojoba oil to encourage the skin to have a balanced pH. Apply aloe vera and cocoa butter to areas of the skin more prone to heat rash. Your skin and hair can get some pretty heavy abuse in the humidity and heat of summer. Hair frizz and sunburns are common complaints that you may find as the heat climbs. Create a no-stress hair routine by using a taming creme after drying your hair. Reduce the amount of time you dry your hair with a blow dryer to encourage natural oil production. These tips should help create a natural look that can truly beat the heat for summer fun. A lot of different men and women believe that they have done everything they could to lose weight. You might become discouraged when you are not able to obtain the results that you were looking for. Many different diet plans focus on eating a lot in small quantities or eating a little in large quantities. The key to getting better results involves creating a personalized weight loss plan that can help you lead a healthier lifestyle. This is also the key to maintaining your smaller size for a long time. One of the most important parts of losing weight involves knowing what you eat. For example, you can write down everything that you have eaten in intervals that last for three days. Do not forget to write down the soda and juice that you drink or the different snacks that you might eat. You can even show various professionals what you write down in order to get different types of advice from diet specialists. You should also write down any physical activities that you take part in each day. This will help you figure out what you need to add to the routine of your life. These activities should last at least 30 minutes and can even include playing sports, going to the gym and walking your pets. Do not forget to write down your weight as well. However, losing weight does not happen overnight. It takes time to gain or lose weight and it will be based on what you eat and how much you do. Once you have recorded information about what you eat, you can begin to work on a weight loss diet plan. Your first plan should cover three days. Knowing what you eat can help you lose more weight. Go through your food journal and pick out three different types of unhealthy food that you ate. Replace these choices with other healthier options like fruit. It is important to stick to your meal plan. Eating healthier is not the only part of working on a weight loss plan that works for you. You should also try to do at least one activity a day that gets you moving and takes at least 30 minutes. Performing various physical activities can help you burn more fat. This might include going for a bike ride, dancing, skating and even using fun workout videos. These activities help you burn between 200 calories and 400 calories. A lot of men and women give themselves a treat after around a week of dieting and working out. For example, you can give yourself a slice of cake, a burger at your favorite restaurant or your favorite sweet treat. However, you have to watch how much you eat and you need to make sure that you do not overindulge. Eating more than one treat for multiple days at a time can make it more difficult for you to keep track of your cravings. Hair removal is a serious concern for anyone who wants to appear sensual, feminine or just well-kept. Waxing is a popular solution because the results last longer than shaving and frequently cause less ingrown hairs. As at-home is readily available from drug stores, and many salons provide the services, more types of wax now exist than ever before. The two basic types of wax are strip and stripless, and many beauty salons will carry both. Strip wax, or soft wax, uses a fabric strip that users press down to the wax. They then pull the fabric away from the skin to remove hair. This wax tends to be thinner and is good for areas of the body that are less sensitive. Because stripless wax, or hard wax, doesn’t require strip application, the entire process may go more quickly than with strips. Stripless wax is thicker and doesn’t require the muslin strip. Users pull the wax itself away from the body, and hard wax is often better for more sensitive parts of the body, including the face. For at-home users, some kits come with pre-waxed strips that do not require them to apply wax and then the strips separately. These strips usually come in pairs, which the users pull away. The wax on pre-waxed strips is frequently thin and requires only the hands to be warmed to usable temperature. Hot wax is the type that most people are familiar with. It requires heating, often over a burner or in a microwave. There is an ideal temperature for hot wax, and overly-hot wax may burn the skin, especially in sensitive locations. As hot wax cools, it becomes more difficult to apply, so reheating may be necessary. Ingredients may differ between brands and typos of hot wax, so consumers should examine the list before making a purchase if they’re away of any ingredient sensitivities. Ready-to-use wax requires no special heating, and uses can use a tool to apply it to skin directly out of the container. This is becoming more popular as people have burned themselves on hot wax in the past. However, it may not apply as well as hot wax if the formula isn’t correct. Home-made wax is popular among consumers who want to save money and move away from chemicals that may exist in store-bought wax. Some formulas include sugar, honey, wax and lemon juice. However, the texture is not quite like that of actually wax. Recipes like this do require heating and can separate if not fully stirred. Wax as a hair removal technique does not provide permanent results like laser to remove hair permanently. Users will reapply wax when hair begins to show. However, the wax requires hair that is long enough to grab onto, and this may mean that hair must become longer and more obvious in between waxing sessions. For users who want an absolutely hairless look, professional services like those from a beauty clinic in Singapore (Privé Clinic)might provide the best balance between beauty and the wallet. There are many people who have had to deal with acne over their lifetime. While it is a condition that is associated mainly with teenagers, the scars that are left behind after the face has cleared up can be a permanent issue. Today, more and more people are attempting to treating acne scars at home. Unfortunately, visiting a professional spa or dermatologist can be expensive. There are actually a few ways to treat acne scars at home that are inexpensive. While each method or treatment may not work for every individual patient, many people have seen enormous results. It is imperative for anyone who is dealing with acne scars to wash their face each day. Washing the face with a gentle cleanser every night is important to rid the face of perspiration , pollution and makeup from the day. After washing, the face should be dried by patting the skin down with a soft towel. Although many people claim they wash their face each night before bed, the proof will be easy to see. Many people will choose the professionals to help with their acne scars and other facial issues. Choosing to see a dermatologist is an excellent idea especially if a person is constantly dealing with skin issues. This dermatology site is a great resource to read before, after, and while under the care of a dermatologist. The site offers amazing advice for people dealing with acne, acne scars, and other skin conditions. It is important for people to be able to connect with others who are dealing with the same sort of skin problems and that is where www.dermatologist.sg comes into play. Not only can people learn more about proper skincare on the site, they can also find a professional dermatologist in their area who specializes in acne and acne scars. They can then easily contact their local dermatologist and set up an appointment for a free consultation. Fortunately, their dermatologist will be able to offers solutions that are affordable and effective such as Microdermabrasion. Microdermabrasion is a popular treatment used to treat a variety of skin problems but many patients have completely rid their faces of acne scars with it. The process is not a painful one and can be completed in a dermatologist’s office or at a skincare spa. Microdermabrasion works by gently sanding the skin’s surface to rid the dead skin cells and other issues off of the face. Because of it’s gentle nature, it is an excellent tool to use at home or by a professional to treat scars and other skin problems. Although professional help is smart for acne scars, completing the job at home is much more affordable. It can be beneficial to use homemade scrubs each day. There are many excellent scrubs that can be made at home. Combining sea salt, coconut oil and honey in a bowl and applying all over the face can to wonders to skin with acne scars. It is important to rinse this scrub off with warm water. When an ankle suffers a sprain the tough ligament tissues surrounding the ankle have been over-stretched or possibly even torn. The ligaments are tight bands of tissue providing tremendous support for the ankle’s movable joints while also allowing for an amazing range of flexibility. There are numerous causes of a sprained ankle with uneven ground or floor surface among the most common. If the foot hits the ground unevenly or twists with excessive force or speed, the body’s weight moves downward upon the ankle and forces an extension of the ligaments surrounding the joints. The ligaments that are affected in a sprain are usually either on the outside of the ankle joint, if the foot has inverted, or (less commonly) those on the inside of the joint if the foot has turned outward. The degree of injury is divided into three classifications called grades. A Grade I sprain is the least severe in terms of injury to the stretched ligaments. While painful, the most common symptoms are swelling and tenderness of the affected area. Most individuals are still able to walk without assistance but jogging and running will be painful until the ligaments have healed. 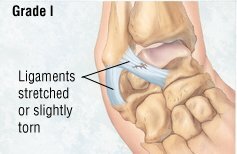 With Grade II sprains the ligaments have undergone more severe stretching and even partial tearing of the tissues. There is a great deal of pain, swelling and even bruising from bleeding beneath the skin’s surface. Some walking with a Grade II ankle sprain is possible but painful beyond a few steps. 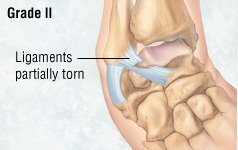 A Grade III sprained ankle is the most severe injury to ligaments. A complete tear of the tissues occurs and makes walking extremely difficult and painful. Bruising and swelling cover the affected region and there can be numbness in the toes. According to Providence Orthopaedic Clinic in Singapore, a number of treatments administered in the initial 24 to 48 hours following the injury can help a mild to moderately sprained ankle heal. Elevate the sprain higher than the heart and apply ice for ten to fifteen minutes at a time as often as possible. Use of a compression wrap from toes to calf is acceptable but care must be taken to not wrap too tightly. Resting the ankle helps the ligaments heal. Providence Orthopaedics described the ankle pain in details.